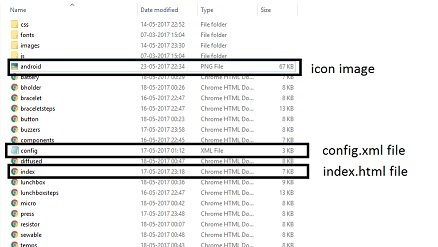 You must have made html files including index.html file in it as shown in a previous post. Then you zip it, upload it and build it on build.phonegap.com, but the name and icon of yout app does not change. 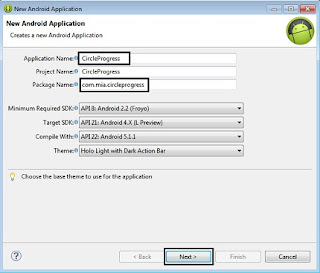 You must add config file to your app to change it. Let me show you how. 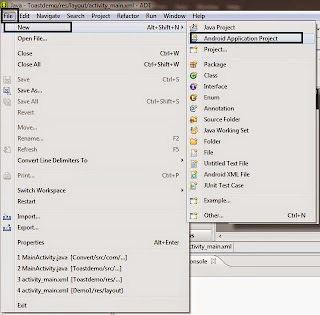 Step 1 : The sample config.xml file can be found here. You can make changes according to your application. 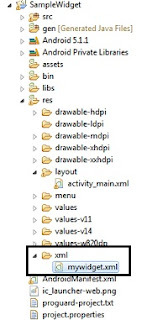 The config file for my app is shown below. 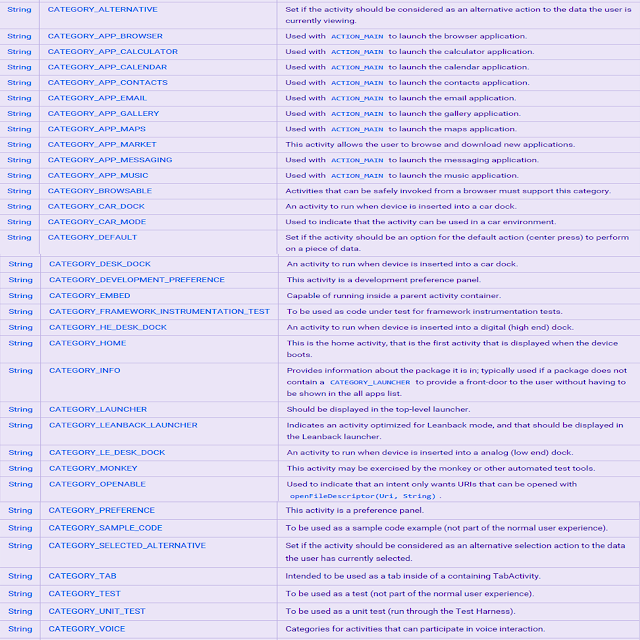 I have included almost all the permissions for my app, but you can modify yours accordingly. 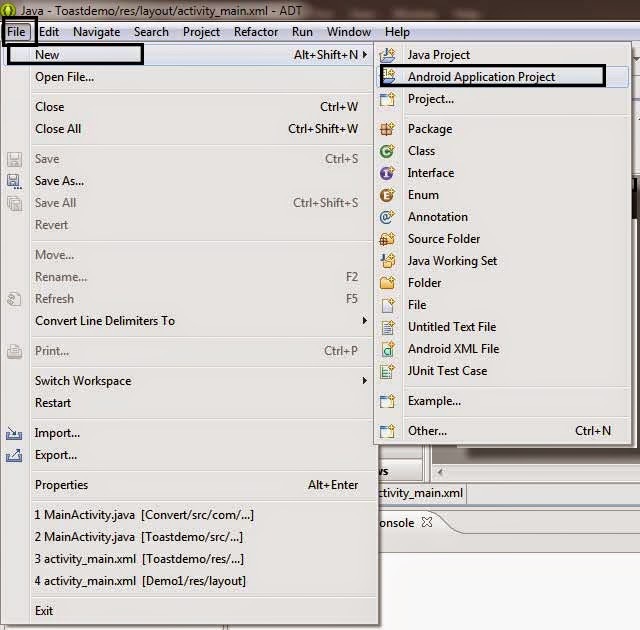 Step 2 : Add the config.xml file in the main directory of our application folder. Step 3 : Zip the folder, upload it on build.phonegap.com and build it as shown in a previous post. The icon will appear there after it builds successfully. What we will do ? 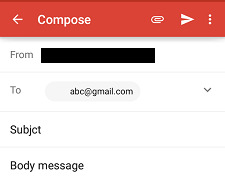 -> We will ask user to input recipient email id,subject and body of the email, then we will send the mail through a email service present in the mobile. What we will need ? Step 1 : Create a new application. Go to File->New->Android Application Project. Step 2 : Give a Name as SendEmail and package name as com.mia.sendemail to your application.Click Next continuously. 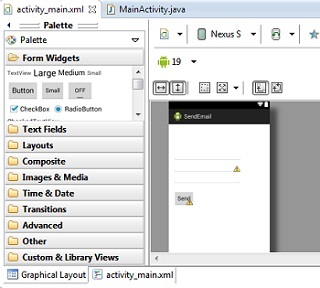 Step 3 : Drag 3 EditText and a Button from the Palette to activity_main layout.The code is shown below. Step 4 : Open MainActivity.java from src->com.mia.sendmail and copy the code below in it. We have used 3 EditText for entering email-id, subject and message of the mail. Then we use a Button to send the e-mail. We assign the EditTexts and Button to their respective variables. Under the onClick() method we convert the input from the EditTexts to String using toString() method. Then we prepare an Intent named email of ACTION_SEND is used to perform action of sending some data by using this Intent. putExtra() method is used to add extra data to the Intent. 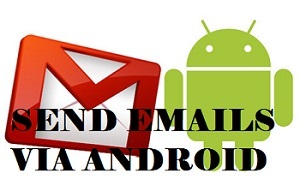 We add the email-id,, subject and message to the Intent by using its respective methods. There is also a provision to add BCC to the mail. Then we start the activity using startActivity(). 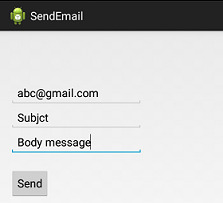 "Choose an Email client" message is used to choose specific email client from those available in the mobile phone. 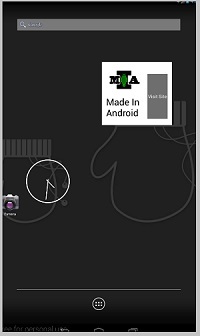 -> We will make a sample homescreen widget with text, image and button. 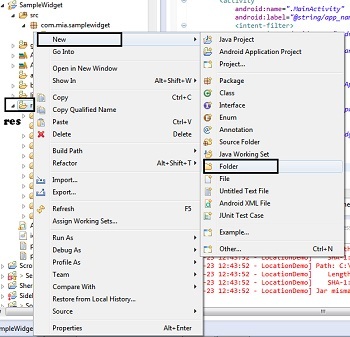 Step 2 : Give name as SampleWidget and package name as com.mia.samplewidget. Then click Next continuously. Step 5 : Right click on xml->Android XML File and name it as mywidget.xml. 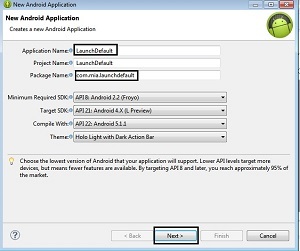 Step 7 : Open AndroidMainfest.xml and alter the default code to the below code. Step 8 : Run the application. 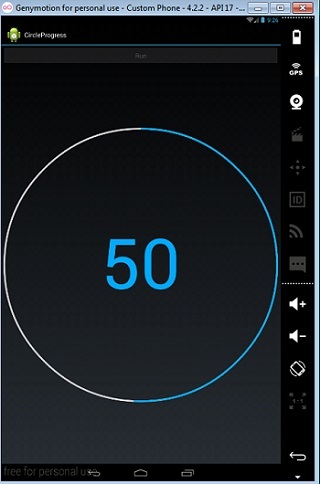 Then go to Widgets section from your Emulator/Mobile and drag the widget to the homescreen. ->We will launch default (in-built) calculator in the android app you have made. Step 2 : Give a Name to your application as LaunchDefault and package name as com.mia.launchdefault. Then click Next continously. 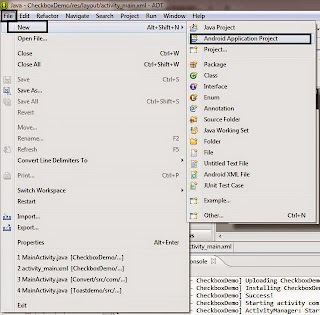 Step 3 : Add a Button to activity_main.xml. 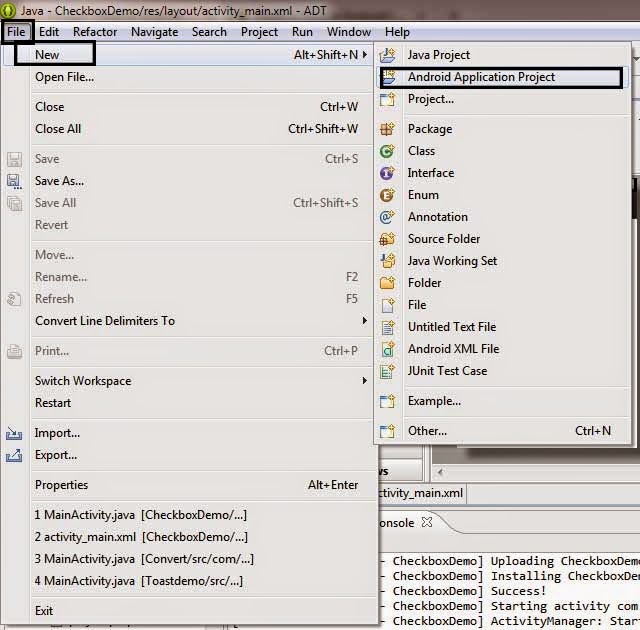 Step 4 : Go to MainActivity.java from src->com.mia.launchdefault. 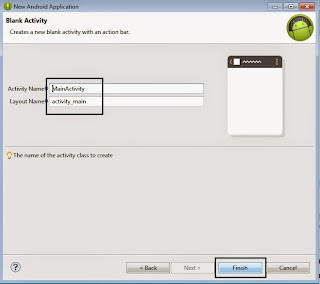 Code for MainActivity is as follows. Step 5 : Run the Project. Calculator will open as you will press the button. We will prepare an Intent object named i. Then we use setAction() to open the MAIN i.e. first page of the desired app. 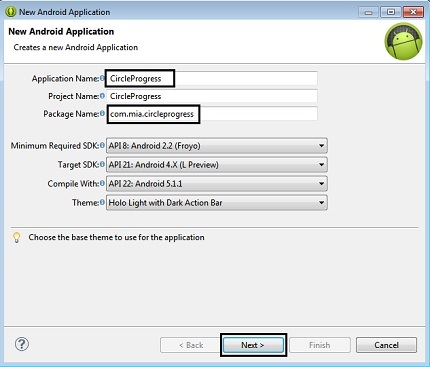 Then we use addCategory() function and add calculator using CATEGORY_APP_CALCULATOR. We can also launch many other inbuild apps using the following categories. 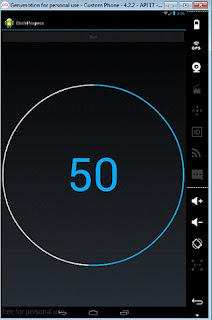 -> We will make a circle progress bar with increasing percentage in between the circle. Step 3 : Create a new xml file in res->values and name it as attrs. 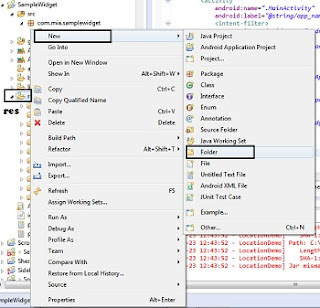 Right click on values folder->New->Android XML File and name it as attrs. Step 4 : Make a new class in src->com.mia.circleprogress. Right click on com.mia.circleprogress->New->Class and name it as MeterView. 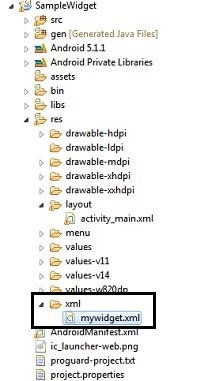 Step 5 : Go to activity_main.xml found in res->layout and copy the below code in it. 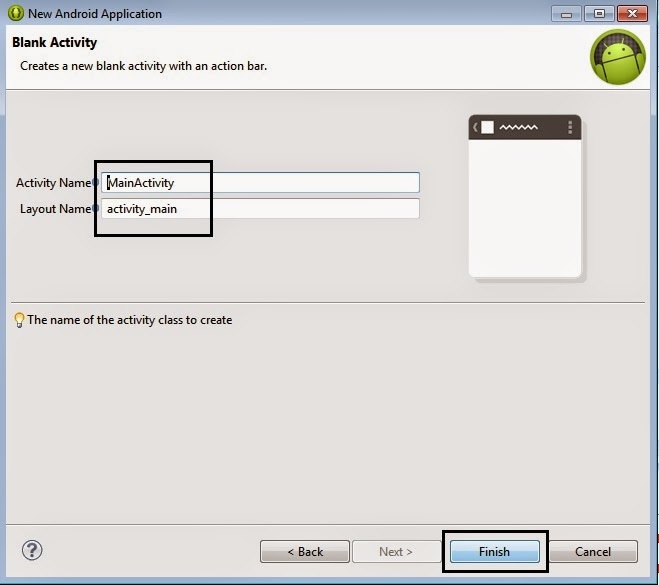 Step 6 : Now open MainActivity.java from src->com.mia.circleprogress. Copy the below code into it. Step 7 : Run the application. First we define a LinearLayout under which we have another Linear Layout and a meterview widget which we made it ourselves. In the inner LinearLayout we have a button with id=run. When we click the button the progress will start. 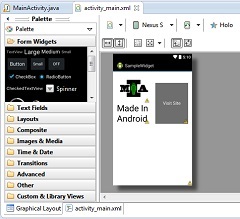 This class creates the widget MeterView which we have used in activity_main.xml. The onFinish() method of the MeterView we will make a Toast displaying done. In onClick() method of the Button run we will start a Thread which will run from 0 to 100.